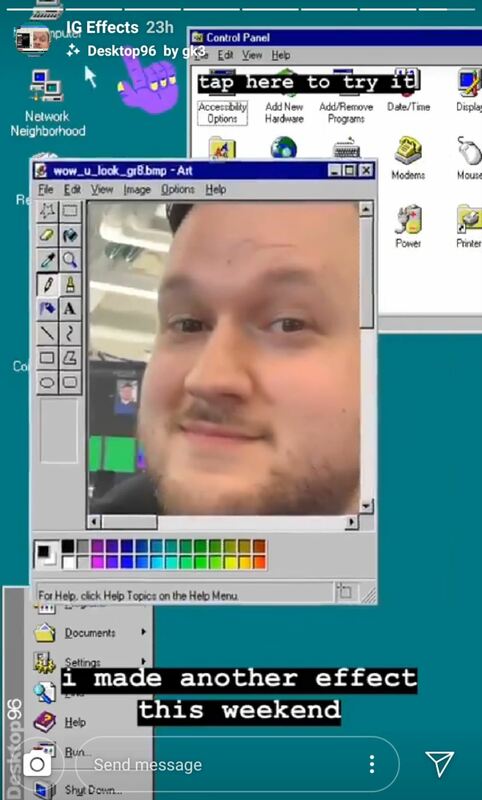 Shared via Twitter on Monday, Instagram product designer George Kedenburg III has published the "Desktop 96" camera effect, which emulates the classic desktop interface of Windows 95. 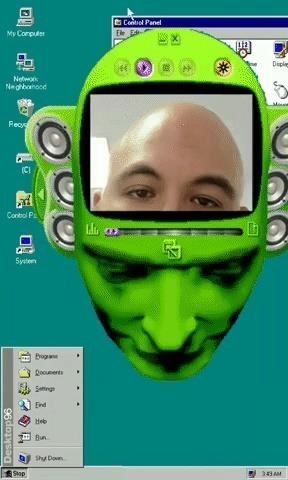 The front-facing camera inserts the user's real-time image into the center window, which moves (along with the mouse point) around the screen based on the user's head movement. 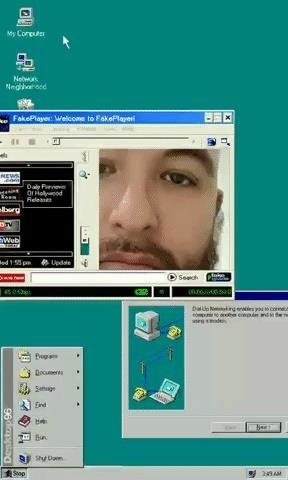 In addition, tapping the screen changes the application window between "Fake Player," MS Paint, and a Winamp-like skinned music player. 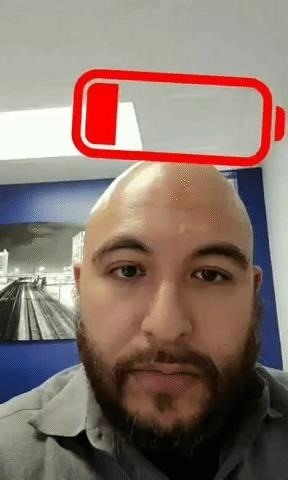 Last week, Kendenberg, who works on Facebook's Spark AR platform, also created a "Battery Life" camera effect, with a battery meter anchored above the user's head in the camera view. The battery meter cycles through ascending and descending levels along with head movement, while tapping the screen repeatedly changes the battery level and lighting effect on the scene, culminating in a "cracked screen" when the battery level reaches zero. To access the AR effects, log into Instagram and visit Kendenberg's Instagram profile. 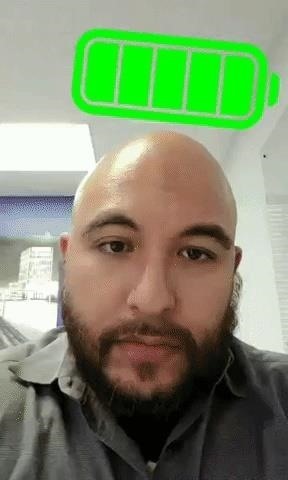 After you're logged in, go to his highlighted "IG Effects" story, then click the embedded link. 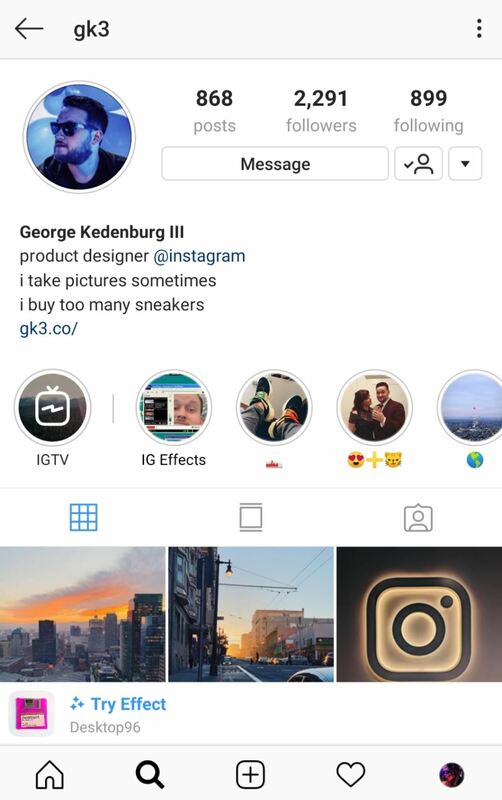 Alternately, a link to the "Desktop 96" experience appears at the bottom of his profile in the Instagram app. At the F8 developer conference last May, Facebook announced that it would extend its Camera Effects AR platform for creators to Instagram and Messenger, with brands getting the first crack at the tool. Then, in October, the company launched a closed beta of the tool, alongside a rebrand of the platform, which is now called Spark AR. In recent years, Instagram's user growth has far eclipsed that of Snapchat, as the photo sharing app (along with the Facebook and Messenger apps) has steadily added features emulating those of the Venice, California-based startup. And while the emphasis on AR isn't as pronounced on Instagram as it is on Snapchat, the availability of those experiences only serves to maintain and increase Instagram's market dominance.